"Burna-Boom Oral History Project series"
205 records – page 1 of 5. Series consists of Oral History Project records which were created under the direction of the Community Heritage Commission. Series includes audio files as well as visual records collected to support the project. 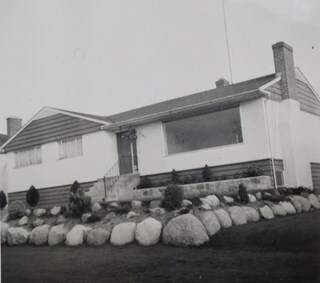 Interviews were completed, featuring current Burnaby residents and indexed recordings of their memories of Burnaby in the 1940s and 1950s are available to listen to on Heritage Burnaby. 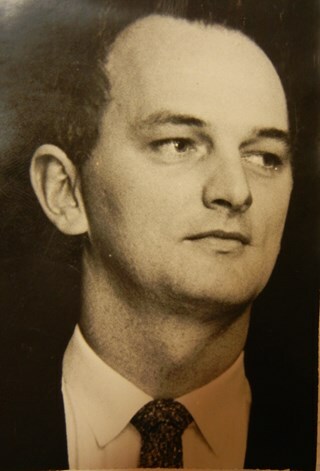 Photograph of Edward Lewis "Ted" Burnham. 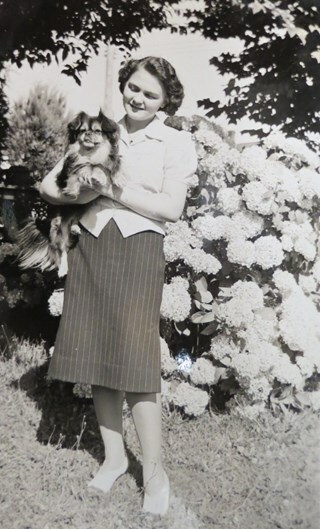 Photograph of Hazel Simnett standing in a garden, with a small dog in her arms. 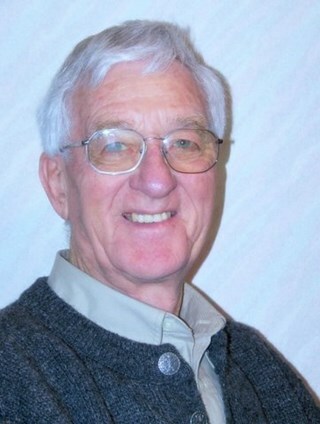 Photograph of Ron Smitherman, smiling. 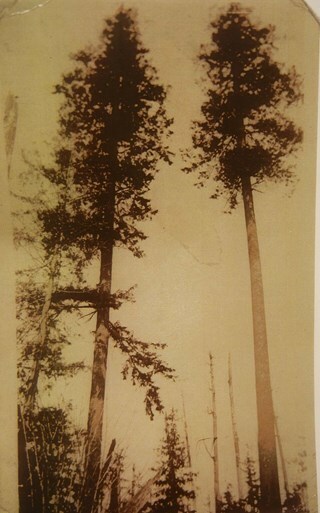 Photograph of trees on Burnaby Mountain. 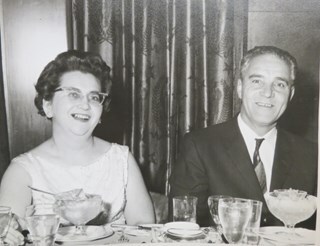 Photograph of Violet and Lawrence Brainerd. 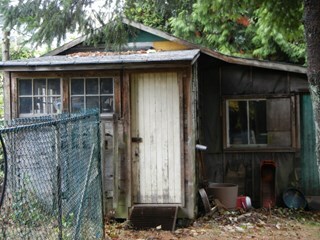 Photograph of the original backyard shed on the Champion family property. 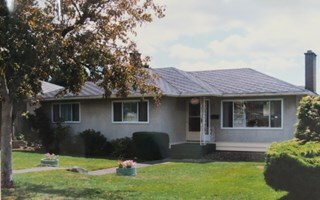 Photograph of the Toebeart family home in Parkcrest. 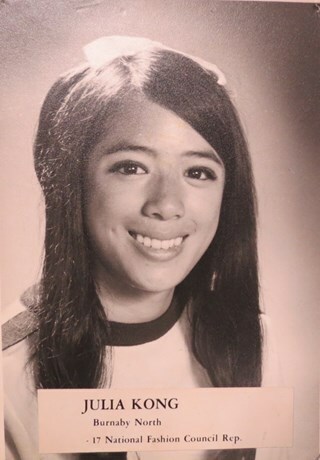 Photograph of Julia Kong (later Poole) taken while at Burnaby North High School. Photograph of the Padula family home in Brentwood. 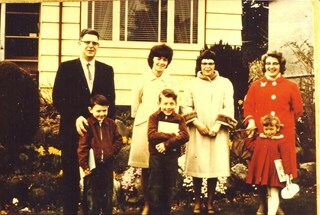 Photograph of John Poole (at centre) and others standing in front of an unidentified house. 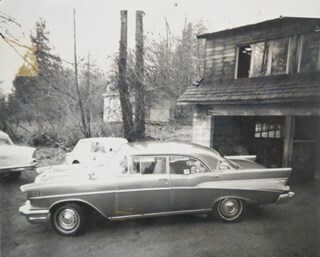 Photograph of John Poole's 1957 Chevrolet parked in front of an unidentified building. 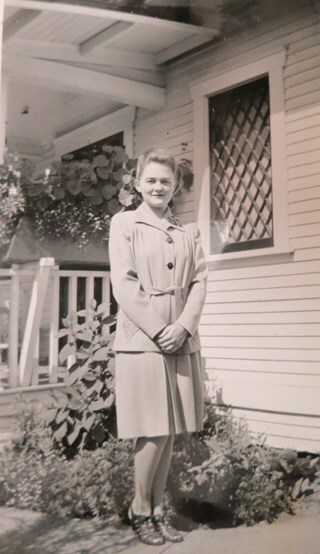 Photograph of Hazel Simnett standing in front of a house. 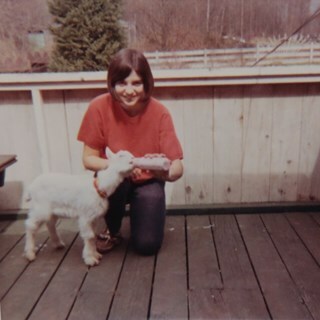 Photograph of Charmaine "Sherrie" Yanko (later Bayntun) smiling at the camera as she nurses a goat from a bottle. 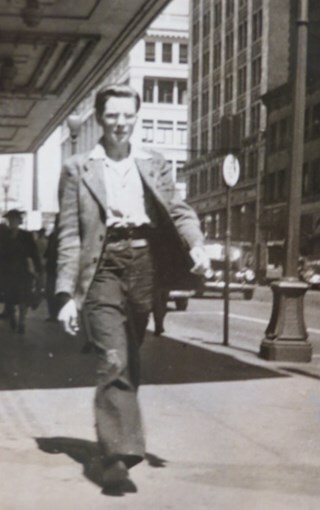 Photograph of Roy Brainerd walking along Granville Street, between Dunsmuir and Robson in Vancouver. 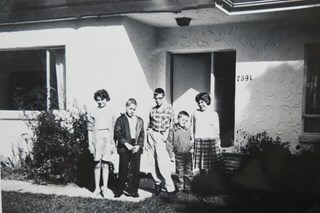 Photograph of Dennis Brown, his wife Cice (Chandler) Brown and their five children, standing together in front of their home. 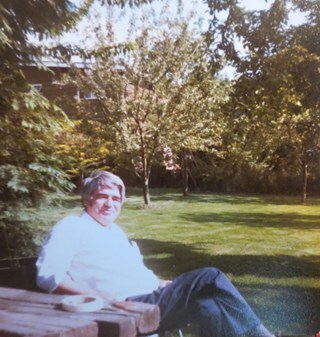 Photograph of Tony Fabian relaxing at a picnic table on his property. 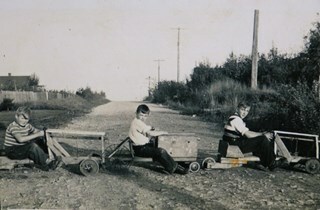 Photograph of three boys on their soap box race cars at Norfolk Street near Royal Oak. 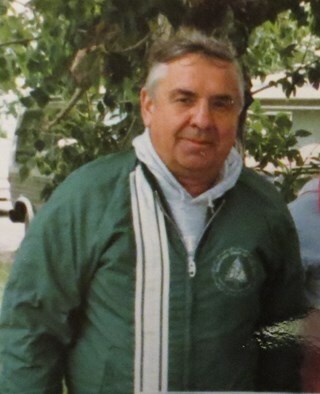 Robert "Bob" Lowe is the child in the middle. 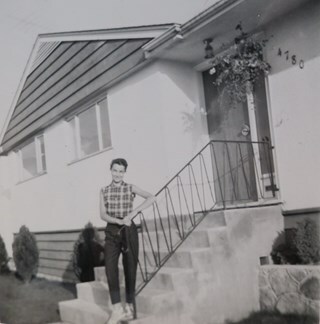 Photograph of Hazel (Bongea) Padula standing on the steps of her home in Brentwood. 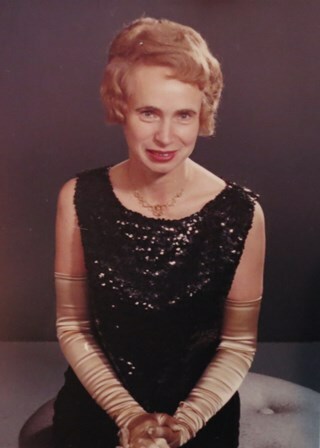 Photograph of Ingeborg (Weigler) (Haacke) Raymer in an evening gown and long-sleeved satin gloves. 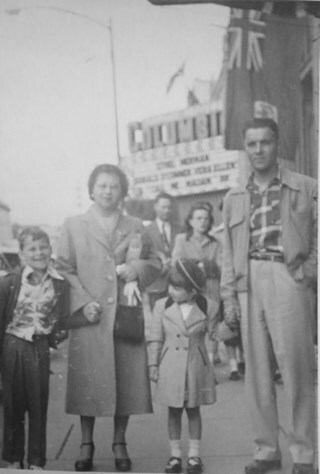 Photograph of Allan, Helen, Diane and Jack Stiglish standing on the sidewalk, in front of a movie theatre in New Westminster. 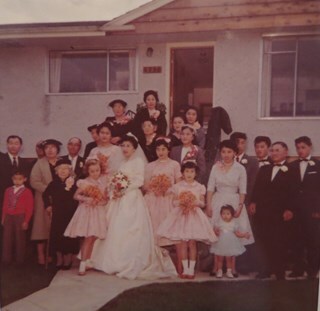 Original spelling of surname "Stiglish" was "Stiglich"
Photograph of Chiyoko "Chic" (Haya) Tanaka on her wedding day, surrounded by her wedding party. 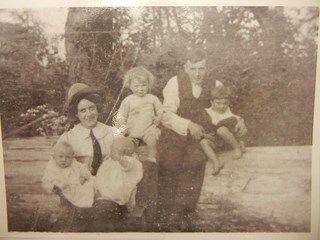 Photograph of the Brown-John family; Victor, his wife Winnifred, their two eldest sons Victor and Archie, and twin boys Frank and Roy. 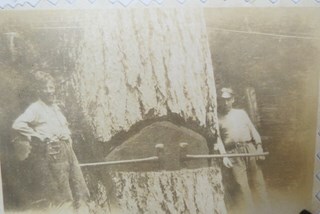 Photograph of Archie Brown-John and an unidentified man working with a crosscut saw to cut firewood. Archie is on the left, wearing a fedora. 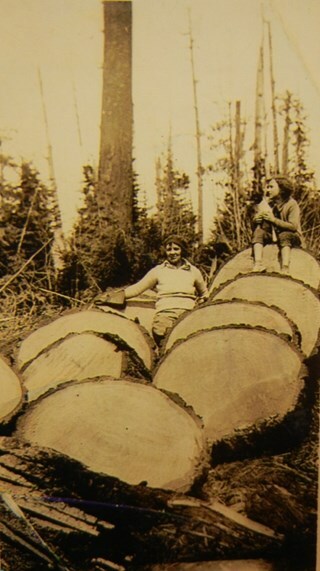 Photograph of two unidentified girls sitting on top of a large pile of cuts. Archie Brown-John was believed to have cut this wood down for firewood. 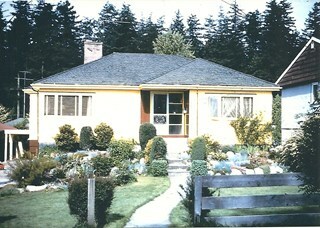 Photograph of the Brown-John home in Burnaby. 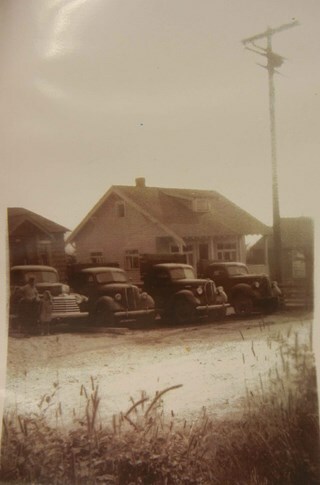 Four large trucks are visible parked in front of the house. 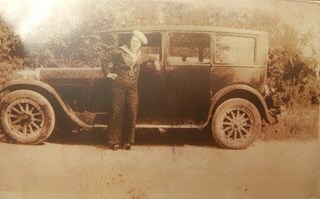 Photograph of Winnifred Brown-John standing at the driver's side door of the family's 1924 Dodge. 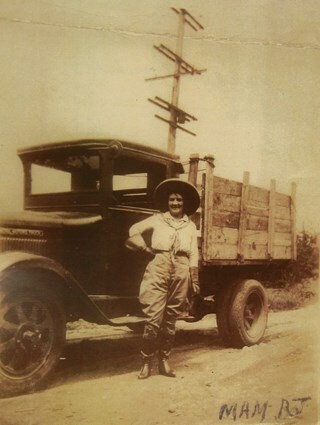 Photograph of Winnifred Brown-John standing in front of the truck she used to transport firewood from Burnaby Mountain. 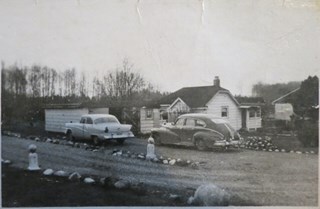 Photograph of Frank Brown-John's junk yard. Four unidentified men are visible sitting on the trucks in the parking lot of the junk yard. 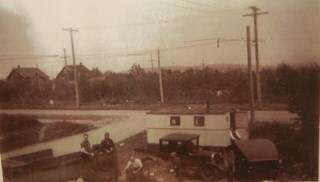 Photograph of the Brown-John trucking office. 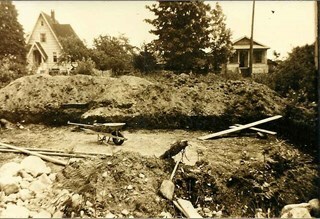 Photograph of the hand-dug excavation at Willingdon Avenue where Cice and Dennis Brown first erected their home. 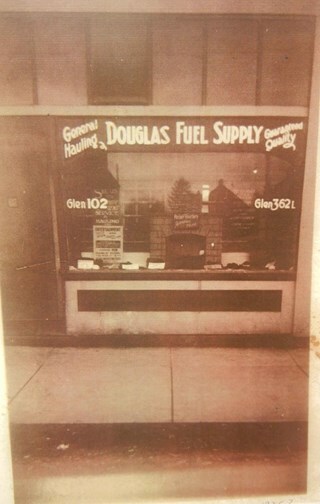 Photograph of Dennis and Cice Brown's house on Willingdon Avenue. 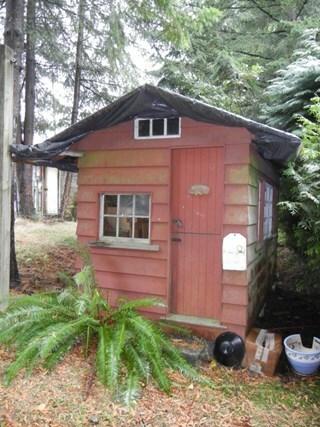 Photograph of the original backyard playhouse on the Champion family property (the windows on the playhouse are from an early Stanley Park beach house). 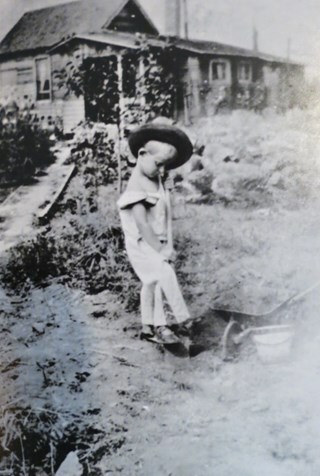 Photograph of an unidentified child standing next to a wheelbarrow, with a house in the background. These are the original owners of the lot at Hardwick Street that was later bought by Tony Fabian. Photograph of Tony Fabian's house on Harwick Street. 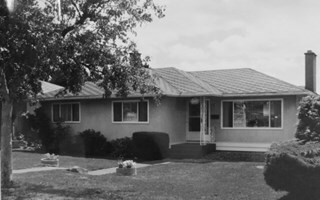 Photograph of Tony Fabian's house on Hardwick Street. 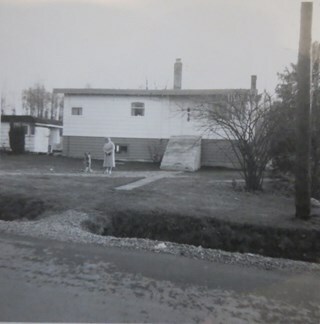 An unidentified woman and a German shepherd dog are visible standing in the front yard. 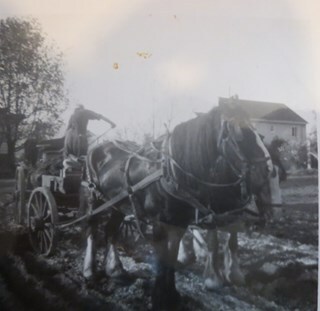 Photograph of a man using a team of horses to help him lay fertilizer on the yard at Tony Fabian's house on Hardwick Street. 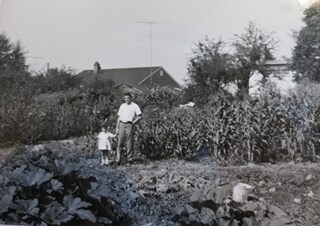 Photograph of Tony and his daughter in their back garden at Hardwick Street. 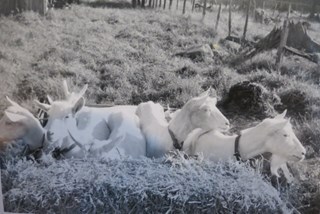 Photograph of the Fabian family's neighbour's Saanen goats washed for a dairy goat show at the Pacific National Exhibition. 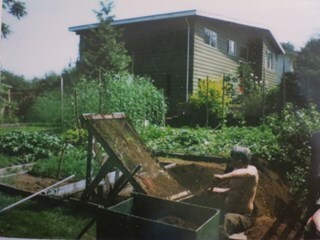 Photograph of Tony Fabian using new gardening techniques to improve his garden at Hardwick Street. 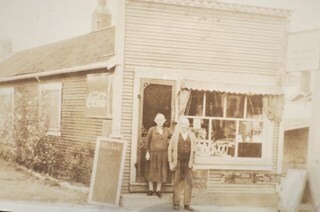 Photograph of Mr and Mrs Bertrosol standing in front of their McKay Avenue watch repair shop. 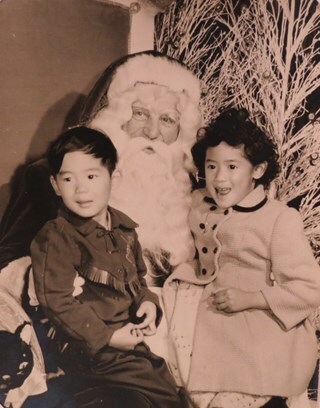 Photograph of Julia Kong (later Poole) sitting on Santa Claus's knee with one of her siblings. 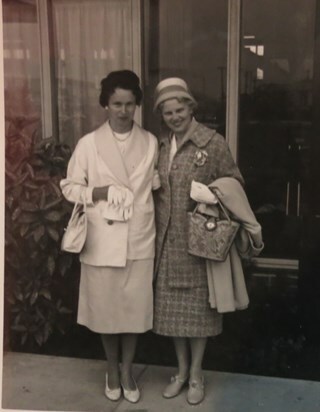 Photograph of Ingeborg (Weigler) (Haacke) Raymer standing next to an unidentified woman wearing a checked skirt and jacket. Ingeborg is dressed in a light, solid colour. The two women are standing outside of an unidentified building and smiling at the camera. 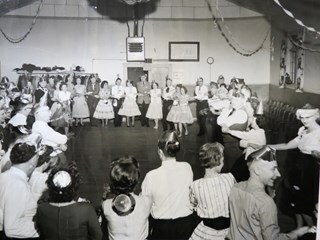 Photograph of the Burnaby Heights Square Dance club. The location has not been identified. 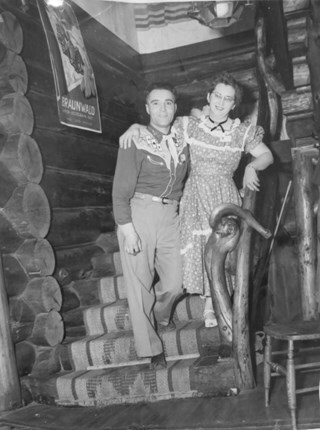 Photograph of Helen and Jack Stiglish in square dance outfits. Helen and Jack were part of the Burnaby Heights Square Dance club. 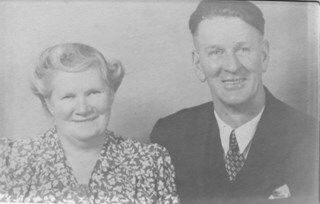 Photograph of Helen and Jack Stiglish. 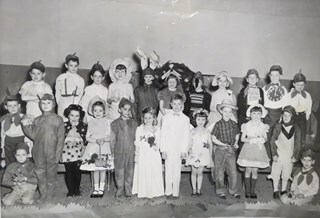 Photograph of a school play. Diane Stiglish is standing in the front row, second from the right. 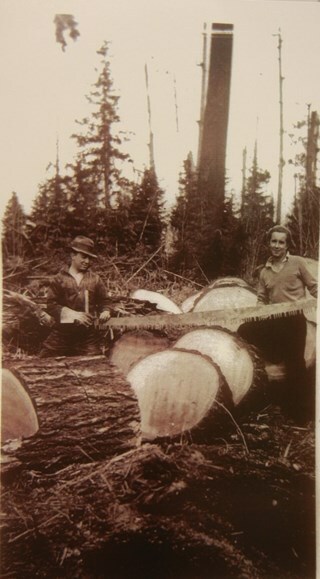 Photograph of Gus Rintanen clearing land with an unidentified man in either Oregon or Washington.